Michael “Eddie” Edwards is a legend of British winter sports, competing as a ski jumper in the Calgary Winter Olympics of 1988, despite little experience of this terrifying and demanding event. 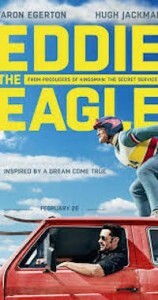 Fletcher adapts his life story into an engaging and uplifting comedy-drama, as the underdog (Egerton) finds a coach (Jackman) with a similar outsider spirit, to together prove the doubters wrong and fulfil Eddie’s Olympic dream. “A solid gold winner” (Empire Magazine).